Now I'm a train person. I used to catch the bus into work and sample people's underarm deodorant each day. Now I get a seat, I get to read my book and I am entertained by the delightful sounds of 'sad train driver' and 'homey-G train man'. Saddest train driver announced each station as if he might just get off at that one and thrown himself under an oncoming train. I stared adding dialogue to his spiel "Wilston, Wilston station. This is a Roma street train stopping all stations to Roma street. 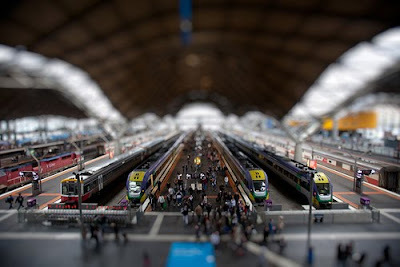 I'm going to end it all, at Roma, Roma street station." Then we have the b-boy, who sounds like he should be sniffing solvents and tagging stuff under a bridge somewhere. "Fortitude Valley, dis is Fortitude Valley station. Anyone who wants to buy some weed, this is the best for you bro." On a train theme, I have a babushka doll bag to give away to one lucky reader! (It's a little bag ... for a kid) I took a very, very long train trip in 2008. With my two best friends I travelled almost 8000km through Russia, Mongolia and into China. Boxed wine and instant soup all the way. In a little town called Sergiyev Posad we bought little babushka dolls. Beautifully painted and signed by the artist. Much nicer (and cheaper) than the ones in the main drag in Moscow. So to win this little bag (for a kiddo) just leave me a comment or retweet this post. I will draw a winner next week ... so get commenting and tweeting. Toot Toot. Loved reading about your trip - great pics too! 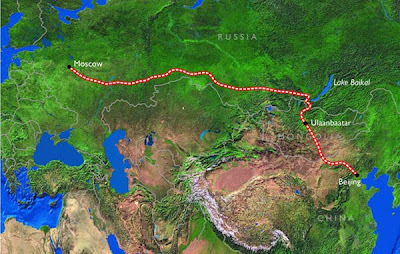 Oh my gosh, taking the Trans-Siberian railroad is one of my dreams.Im currently in Korea and it would be soooo easy. I havent heard of many people that did it so would love to hear what you have to say about it. Just by judging on the photos, it looks like you had a wonderful time! 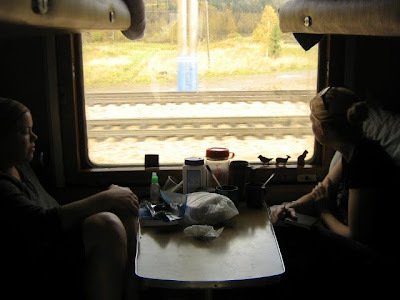 You took the train trip I have always dreamed of doing. Ahh, some day ... It sounds so incredibly romantic. I love your Babushka and know just the little kid I'd like to give it to. That looks like it was a fabulous trip! Loving these babooshka bags - too cute! brings back my little trip to russia - i only did st petersberg and moscow though. 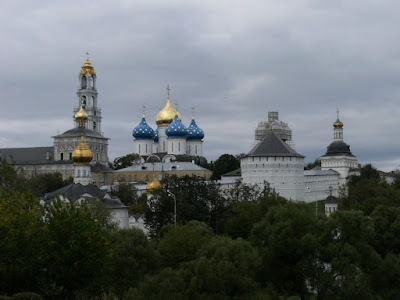 I loved the grandious way that russia made me feel. I wish I could attend the BrisStyle markets - I went once and loved it. unfortunately my work times don't agree with me going. This makes me sad. I want a cute way to remember my trips of babuska-land! Well isn't this a whole lot of loveliness wrapped up in a splendid post! I need to put Russia on my list of places to travel now. Thanks for following :)I already love your blog! At 10:45pm I don't know how creative I can be in my comment apart from I have an 8.t year old daughter who loves everything Babushka (Kabooshka she says)& who is also into trains ... the modelling kind of ones her granddad has. Nothing beats running to the corner on the footpath at Granddad's house upon hearing the whistle of the tilt train & seeing it fly through Geebung Station & seeing if they get there before the train.